Private Review Portals are areas external of the workspace where your judges/reviewers can go to evaluate and review applications assigned to them. Instead of inviting a reviewer into your workspace, creating a Private Review Portal gives you extended control over which applications your reviewers see as well as which documents and information from the application they see as well. What does the review portal look like? You may use the standard review form (called <default> in the dropdown menu) that WizeHive provides or create a custom review form. The standard form allows judges to rate the applicant from one to four (1-4) and provide a comment via a text box field. If you would like a more complex review to be conducted, you will want to opt to create your own review form. A review form originates within the WizeApp settings of the data tab - where you created your main application form. 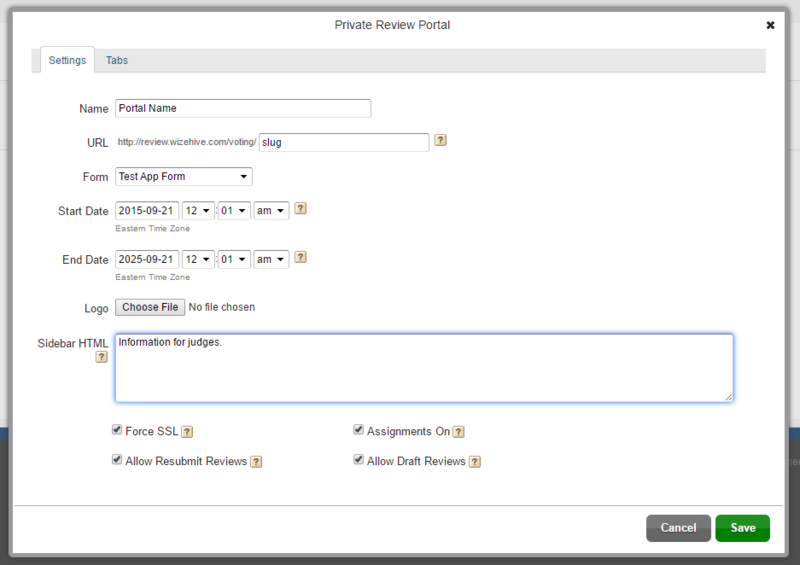 In the Form Settings section, you will see below Template Text several fields that pertain to the Review Form. In the Review Form dropdown, select <Create New Form> in order to initiate a new review form. A popup window will allow you to name your new review form before granting you access to the portal builder for that form. Most likely, your review form will have a total score field. Perhaps your judges rank applicants based on 5 criteria, and their responses are added together. Perhaps the judges simply rank Yes or No. In either scenario, you have a Total Score field. In the first scenario, the Total Score is the 5 scores added together. You could accomplish adding these together through a calculated field. In the second scenario, you could assign Yes the value of 1 and No the value of 0. Further instructions on how to do this here. 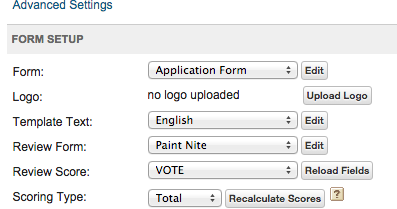 At this point, you can set your Total Score field to be the Review Score in the review score dropdown (above, this is the dropdown set to VOTE). For whichever field is selected here, WizeHive can conduct a calculation across judges. So if 10 judges review an applicant, the system can add together all the Yes answers for that one applicant to get a total number of Yes answers. To accomplish this, Scoring Type should be set to Total. If you would prefer that WizeHive produce an average score across judges, then you can set the Scoring Type to Average. You will need to tell WizeHive the total possible score so that it calculates the score correctly. If the Total Score field could equal up to 50, then the number 50 should be entered here. It is recommended that Scoring Display be set to a number. The alternate is a visual representation of the score through stars. As a Best Practice Guideline, you should never have two private review portals open at the same time. An Application form can only have one (1) active form at a time. If you believe you need multiple portals open at the same time please contact our Support team to provide insight on the situation. Okay, we have our review form. Now it's time to create a portal through which our judges will access this form. 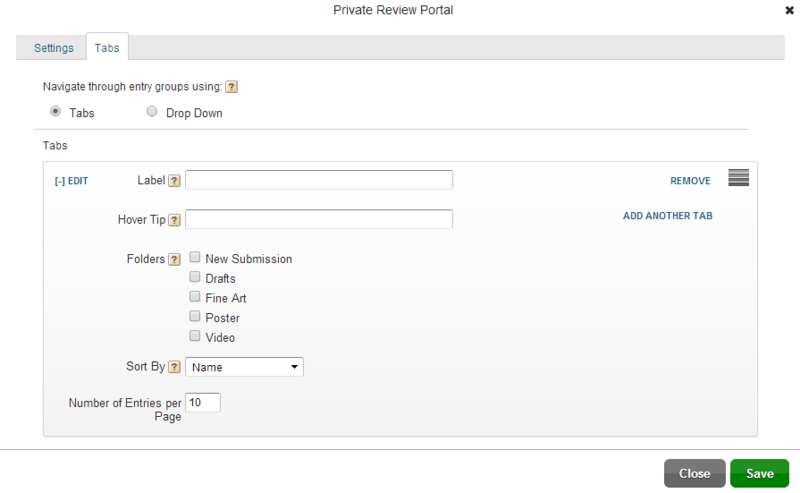 To create the Review Portal, you will need to use the Private Review Portal tab then click on the Add Portal button. URL: The URL will follow the form https://review.wizehive.com/voting/[SLUG] where the [SLUG] is what you type in the text box. The URL specified cannot be in use by any other portal. Start Date/Time: Your portal will automatically open on this date/time. End Date/Time: Your portal will automatically close on this date/time. If there is no end date, simply pick something very far in the future. It will not be displayed anywhere and it is only used to control the availability of your portal. There is a second tab of settings, called Tabs. Tabs allow you to organize the review portal by folder. You can choose to have tabs or a dropdown at the top of the portal where judges can select which group of entries they would like to see. For example, you could have an application that is for three different scholarships. Tabs would allow judges to easily distinguish what scholarship the applications they are looking at are for. Tabs may also be used to activation a folder within your workspace to display in the portal. This is especially useful when you have multiple rounds of review within the same portal. You may add judges by using the People tab. If you have Assignments On, you will need to assign judges to applicants before they can review applications in the portal. When judges log in to the portal they will see the review form as well as the application that they are to review. If there are specific fields in the application that you would not like the judges to view, you may hide the fields in the Form Builder. To test your judging portal you may go to the URL and log in as one of the judges that you have added. Make sure that you see the review form that you expect and that you only have access to those applicants that you have been assigned to. Below is an example of part of a review portal. The review can select the job the applications they are viewing are for, and click on the green Review button to add a review. After the review is complete the Review button will be replaced by a red Done.